36 Challenge done. In-game time 148 hours. This is a long guide. Try Ctrl-F to find what you need. The Agony Crawler's Mortar Skill fires 8 projectiles which shotguns (including 2 additional from helmet enchant). This DPS is calculated without considering Shock Effect. With Shock the Shaper DPS should be above 5M. 3.7M with Tailspike, 7.6M Burst DPS with Mortar. There are variations of this build using the same skill, but different gears and ascendancies. Some of them are dot-focused builds, those pushes damage over time and uses HoAg as a supportive tool. You will find these builds having a different skill tree and item setup comparing to our minion build. - Max block possibility to survive most situations. - Uses melee weapon with molten strike, allowing shields to be equipped. - Allows hybrid with other minions. Here we chose Pathfinder because this is the fastest build I can have among all ascendancies. She can do fast backtracking without running out of flasks, which makes her a good lab runner. 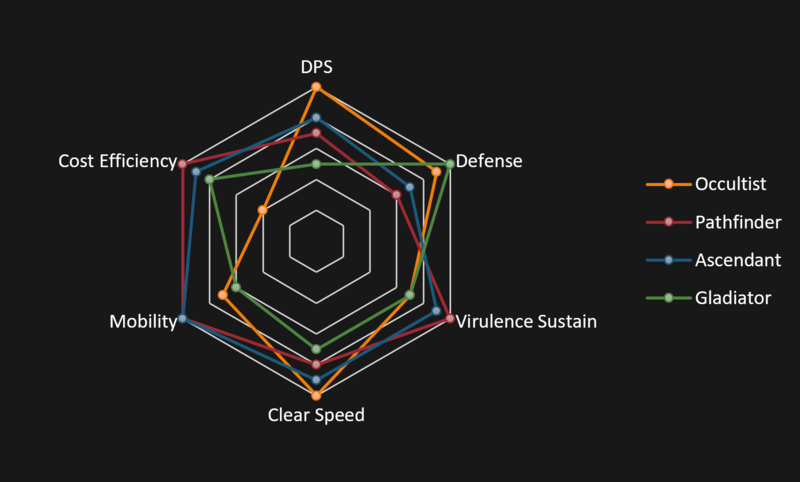 DPS is not our main concern in this build guide. The Agony Crawler has already more than enough dps for Uber Elder without heavy investments like a Hatred Aul's Amulet or +2 Skin of Loyal. You can still do that if you are rich. This is a summoner build maximizing the damage of the Agony Crawler. Agony Crawler comes from the skill Herald of Agony (introduced in 3.4). - When Herald of Agony is active, you gain Virulence stack each time you poison an enemy, up to 40 stacks. This stack decays quickly. - An Agony Crawler spawns when you have Virulence. - The Agony Crawler has 1000-1200 base damage at level 23. - The Agony Crawler gains 4% attack speed and 63-117 physical damage per Virulence Stack at level 23. - This means at a maximum of 40 stacks, Agony Crawler has 160% increased attack speed and 3520-5680 base physical damage. - 40% of this damage is then converted to Chaos damage by default. 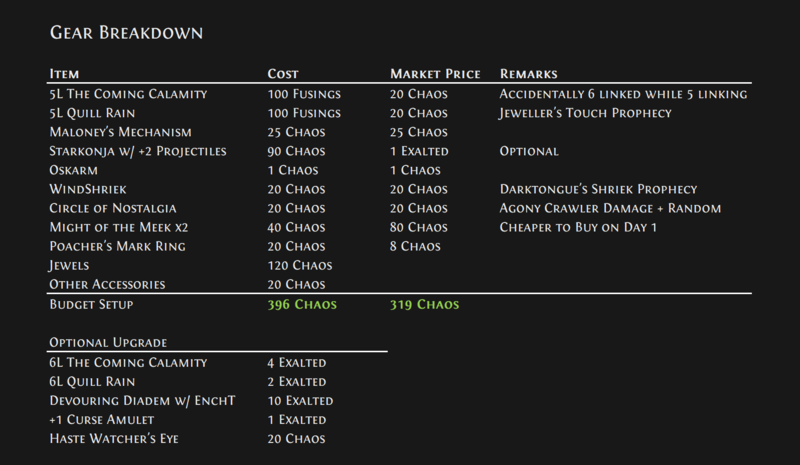 This means that other kind of conversions would also base on the original base damage before the chaos conversion. - Agony Crawler cannot be damaged. - Agony Crawler has 2 attack moves: the split arrow and the mortar. - Split arrow fires 5 projectiles and is constantly used. - Occasionally, it casts Mortar which fires 6 projectiles which can shotgun to deal tons of damage. - Agony Crawler has a slow base movement speed. This makes the AI clunky. The 3.5 nerf is harsh. I feel sorry about those meta players losing directions to play the game. Good news for us, this build has dodged perfectly between bullet rains and is unharmed by the nerf hammer. It is even slightly buffed due to introduction of banners. Some people might misread the patch notes so here's some details to how it works. - The base damage we are using in this build are pure physical damage given by Herald of Agony skill itself. - The increased physical damage per virulence modifier will apply to this base physical damage before we convert it to other elements. - This change would only cause non-physical damage added to minions to not getting the multiplier. - Nerfed examples: Added Lightning Damage support, Added Cold Damage support, Added Chaos Damage support, Innervate support, Anger aura, Wrath aura, Envy aura, Added Elemental/Chaos damage to Minions mods from abyss jewels. - Since we are not using any of these stuffs, we are clean from the nerf. - Unharmed examples: Added fire damage support, Hatred aura, Grip of the Council, Physical to Lightning support, Added Physical damage to Minions mods from abyss jewel. - These are what we used in 3.4. And we will be using it in 3.5 as well. - Quill Rain is nerfed from "40% less weapon damage" to "40% less damage". This means any source of indirect damage that you deal would be nerfed. - Attack-related stuffs e.g. poison, ignite, bleed, damage over time from caustic arrow and toxic rain, explosion from explosive arrow, etc. will now receive the less multiplier (previously don't). - All spells will also receive the less multiplier. Cast on Crit with Quill Rain is bad now. - However, this nerf is only applied to all self-casting skills. Only YOU will be nerfed. Minions are unaffected. There are 2 types of people who sees this 3.6 patch. Those who can't wait to try out the new skills and balanced spells; and those who are afraid of getting trapped and chose the wrong spell. If you are the latter, maybe you can consider a minion starter build like this one. - Curse effects on bosses are buffed. This means elemental weakness is finally back on the menu again. - To understand how it is buffed you need to know how crit chance on minions are calculated. - In 3.5, level 12 Assassin's Mark gives 9% additional chance to crit. - In 3.6, level 10 Assassin's Mark gives 2% additional chance to crit. But this chance is now affected by crit modifiers, so minion will have (5% + 2%) x (1 + 200% x 3) = 49% chance to crit now with 3 power charges. This is a buff. That's a 1% nerf in damage. - There's a new quiver called Maloney's Mechanism. It even has 3 sockets! - It also trigger socketed bow skills when you use bow skill. This means we can have Toxic Rain - Curse on Hit - Projectile Weakness setup on the quiver while we still have a 6L on Quill Rain to do almost anything. GG GGG. - By cutting off the cooldown time from 8 seconds to 4, bad decision making on recalling your crawler is now less punishing. This should be a big improvement to our game experience. Minion Speed Support is still recommended though. - High DPS even if budget(see build progression). Ideal for League Starter. - You need 0 mandatory uniques. SSF-able. - You are ranged and minion shatters enemies. Fairly safe. - Unlimited flasks for boss sustain. - Can do all contents. Including all kinds of boss fights, map mods, delving deep, and even phasing through darkness for fossils when you are out of sulphite. - You need to adapt to the sometimes-buggy minion AI. I have this fixed here. - Proximity Shields are annoying. - Mods that reduces chance to poison will be a bit harder. - You have almost no armour or evasion. Survival would be based on your crowd control skills and flasks. - Not HC viable in my opinion. Some gears in this build provides decent dps but bad survival stats, and is never considered by HC players. This build is written for softcore players and is meant to just push farming speed to maximum prior to survival. You won't die a lot I guarantee, but random unlucky things will happen, you never know. If you are using a Tabula Rasa, you will find yourself unable to 6L the skill due to mana reserve. That's because you need a hemlet enchant for the extra reduction. So yes a 5-link is more than enough as a league starter. 4L setup is the normal way to go, with an aura activated if possible. - Storm Brand - Lesser Poison - Poison - Faster Casting with other weapons. Basically any skills link with Lesser Poison will allow the skill hits to poison. 3. You can play without a skill tree. Skill tree will not grant dps to your minion until very late game. Herald of Agony does not give a fu<k to your items or your skill tree. So either you follow my default tree at random order, or you can choose any other build (e.g. a spell caster skill tree) for easy swapping when you reach maps. As title. That's what you are looking for from gears. - Agony Crawler has pure physical damage added to its attacks. 40% of those would be converted to Chaos by default. While players can try to boost its physical damage, I personally prefer converting the physical damage to elemental ones. Where those 146% elemental damage would gain benefit from Elemental Equilibrium, resulting in a even higher dps. - Only my attacks have EE. This means that I can attack the enemy once and EE effect will stay for a full 5 seconds for my minion. - Getting fire damage to your attacks is easy. You can get one from rings, quivers, gloves, amulets and abyss jewels. Just make sure you don't have other damage types and it will be fine. EB is reworked in 3.5. Using skills no longer interrupt your energy shield recharge. You can now use your energy shield as a solution to mana sustain while your mana is fully reserved. Not sure if it is intended or not, but mobs with "mana leech" mods will currently (3.5.0) considered as a damage to your mana pool, stopping the energy shield recharge. Also, going to EB from our skill tree is a bit too far away and not ideal to invest. This is where the new unique item comes in handy. The Devouring Diadem allows you to have EB automatically, while having a 10% chance to start es recharge when you use a skill. The mana reserve reduction also allows us to use more mana reserve skills, like arctic armour. You can also craft the "120 Energy Shield Regenerated per second while a Rare or Unique Enemy is Nearby" mod on your belt for a even more reliable mana sustain. - You can give minion power charges by either using Necromantic Aegis on a Victario's Charity, or by Assassin's Mark curse. - Conduit has no effect on minions. - Minions gain 200% increased critical strike chance per power charge. - Assuming a minion is having 5% crit chance, 3 power charges would give them a 35% chance to crit. - Since we have physical damage converted to cold and lightning, this means that our minion can now freeze and shock when it critically strike. - With level 10 Assassin's Mark, enemies have an extra 2% chance to receive a critical strike. That means our minion's base crit is now 7% and have a total chance of 49% t crit. It crits every 2 hits. - Given that our minion's base damage is so high, we can often find it perma freezing T15 bosses. - GMP shotguns single target. AoE is not ideal for packs. - Stacks the fastest against single target. Minions from behind are dangerous. - The delayed explosion shotguns in a very large AoE radius. This as well apply slow to the enemies. Initial hit does not have an AoE though. Also GMP is required. - Comparing to Toxic Rain, the initial hit has an AoE, shotguns and hits a large area. This is a more instant version than Toxic Rain to stack poison. Does not require a GMP. - You can hit enemies while moving. Poison stacking is effective too. This is a counteract to the quill rain downscaling problem in party play. Use Unleash to maintain a high BV stack. - Good for packs, but way less efficient than Caustic Arrow in single target. - Using Lesser Poison, you can make all elemental skills poison. Firestorm and Abberath's Fury would have the fast hit rate you need for poison stacking. - If you are not playing with bows, using molten strike can definitely proc poison with an insane speed. - Using Lesser Poison again, you can auto-aim enemies without moving your mouse anymore. - This skill has great shotgun capability, allowing multiple poison stacks even on single target. - Yeah brands are now BIS spell for poison stacking. They just hits enemies while you walk around. Cast time is shorter than Winter Orb. Here I chose Rain of Arrows because it gives the fastest animation and response time. It also have a huge area coverage and shotgun capability for both packs and single-target. The Minion Movement Speed is crucial in this build. Due to the nature of fast movement speed in Pathfinder, your minion would often fail to catch up with you. If it cant catch up with you it will be less likely to attack as well. Boosting Agony Crawler's movement speed would result in a way more comfortable experience as you can rely more on the minion's attack. Getting used to minion AI is the biggest challenge in this build. 4. Gears (quivers and belts) with "movement speed" mods that can be dropped or crafted. And at last, I have to mention that the timing for convocation is really important. Try to use it as your last resource. You will also need it to deal with Proximity Shields. This build is fully relying on the damage of Agony Crawler. While in deep delves, due to the narrow path and enormous pack size, if the crawler misses a hit, you are very likely to be dead. Good thing is we have a bunch of new minion accuracy nodes in skill tree after 3.4 patch now. Using the new unique glove Command of the Pit would even make life better, but this is optional as long as you have enough minion accuracy on tree. Considering we can do maps with any mods, the only thing that would slow us down is the Temp Chains mod that constantly come up when you craft red maps. This mod gives good quantity bonus and you don't want to skip it. So to do those maps faster, get yourself a Watcher's Eye with "Unaffected by Temporal Chains while affected by Haste" mod, swap your Hatred-Generosity setup with Haste. You will be unable to freeze mobs but you can now walk faster. Recommended for grinding challenges. There is a trend of farming league contents on a low-level map. This is because every new league contents nowadays will spawn on every map you enter, guarantees a fixed amount of reward. Speed farming those items would sometimes be more profitable than farming end game contents due to imbalanced game design. If you are the type of person who likes to rush these contents on Act 8 Harbour Bridge, simply drop off some life from the skill tree and pick up all movement speed points from ranger. You will be fast af boi. 1. Your last map everyday should be as high tier as possible. 2. Daily Objectives spawned next day will be based on the tier of your last map. 3. 20Q your map, and try get 8 mods from corruption. 4. Do the map with 3 sacrifice fragments. 5. Do your Syndicate with Cameria as Invervention Boss. Get sulphite scarabs and do rotations with other players. 1. Move Cameria to Intervention. This is completely random and depends on luck. 2. Once you get him to Intervention, try give him as much stars as possible. 1. Use Summon Phantasm on Kill for your Herald of Agony. Phantasms would absorb a lot of minion aggro and keep you safe. 2. Use Knockback to blow away monsters that stuck at doorways. This would as well trick your minion AI into walking through doorways before you do. 3. Use Blind to reduce chances to get hit by attacks. Still you would want to dodge skills by walking as much as possible. Especially those rares who can't even be knocked back. 4. Use Wise Oak only when you have same uncapped elemental resistances. The 10% elemental damage reduction is really good. 5. Try to lower your movement speed if you find your minion difficult to clear packs. Use a 0 speed boots like Kaom's Roots if necessary. 6. I personally like to have Phasing so I can get away situations, you can get it from "You have phasing while affected by Haste" Watcher's Eye. But if you do not, just proceed slowly and carefully like I said in (5). 7. Always avoid the exploding blob in azurite fights. Don't even think of tanking it. 1. Boss fights are actually really easy. Keep hydrated (drink flasks), be active (move around) and stack virulence. Flare in darkness phases. - Minion Speed is required since we have fast movement speed and the crawler need to catch up with us. Less move time = more attack time. - Crawler is immune to damage, so Damage on Full Life is easily the BIS. - We are using physical to elemental conversion for Elemental Equilibrium. Either added fire damage or physical to lightning would can do depending on your socket color. I choose lightning because lightning can shock. - Pierce is used for pack clearing. Fork and Chain are also a decent replacement. Especially after they are buffed in 3.6. - Vicious Projectiles replaces Pierce on boss fights. - Summon Phantasm on Kill is a really nice solution for survival. We cannot use Zombies because there are too few minion life and resist nodes on our skill tree. Phantasms on the other hand are refreshable, deals decent damage and can even absorb damage. Not suitable for boss fights though. - Elemental Focus is our final damage buff gem for this build. I have been using Minion Speed all the time and have no issues on minion dps. I am adding this just in case someone needs it. - Blind helps reducing chance to get hit by minions. Combining with Knockback you will be free from both melee and ranged minion attacks. - Knockback is a good support for safety plays. It can also knock back some rare monsters which Chance to Flee cannot. - Chance to Flee is one of the good support in Delve(no joke). It helps cancelling most white/magic minions' attack and spells and thus you can survive much easier. - Applying Maim would slow down the enemies so you will outrun them. - Life Gain on Hit is crucial for sustaining in packs, but you still can't face tank bosses even with barrage. Just learn and try dodge those predictable attacks. - You can use a curse setup here because we don't need GMP to sustain 40 stacks even with single target. I suggest Assassin's Mark for maximum dps. If you want to run multiple curses, Projectile weakness and Frostbite are also very nice. - You can use Projectile Weakness for piercing enemies, but hexproof maps would get you. Better use pierce on your HoAg instead. - Getting Assassin's Mark on your ring would save you 2 links for the crowd control supports. This is also highly recommended. Mark of Submission is one of the choice to do so. - I added Culling Strike for 3.5. This is for those who want to trigger the adrenaline effect from War Banner. You can't do that effectively if you don't cull for kills. But minions always on-shot mobs so I doubt if it helps. - Mirage Archer does not stack poison. Thus this is not an option in our build. Generosity is a must to allow us trigger EE without dealing cold damage. - The new banners added in 3.5 is hard to stack because it requires player to kill/stack impale. - I chose War Banner to provide a permanent accuracy aura for my minion. This way I would consider to use Grip of the Council instead of Command of the Pit. Abyssal Cry for faster pack clears. Minion Damage nodes do affect its damage since you are also affected by those nodes. Quill Rain would now nerf this damage so it is not as reliable as before. This cast on damage taken setup utilizes everything. - Spirit Offering for 19% extra chaos damage. - It would be fine to level your cwdt setup to 20 if you have high life, so your immortal call can actually have a better duration. - Arctic Breath actually creates some chilled ground to slow down enemies. I you are doing bosses or playing defensive swap the Spirit Offering with this. - You can use Arctic Armour for defenses if you managed to do so. Vaal skills are not necessary for this build. - Haste would only be used for Aul's Uprising and Watcher's Eye combo. - Vaal Haste gives a little bit more dps buff to minions for boss fights. - Vaal Impurity of Ice lets your minion's cold damage to ignore cold resist. This is good for map mods that gives monsters extra resistance. Remind you that you have to stand near the enemies as well. - Note that Vaal Impurity of Ice says "ignore minion's resistance". If the monster does not have high cold resist (more than 50) and your EE has already reduced it to negative, using this vaal skill would actually lower your dps instead. - FYI If you hover on a monster and it says "resist to cold" it means it has 40%+ cold resistance. - This allows us to poison as fast as possible, and maximizing the Life Gain on Hit effect. - Since the attack speed is so high, we have to use Blood Magic to bypass mana issues. - One little trick is to get a "+2 mana gain on hit" jewel. This would allow you using skills without Blood Magic. - You can also use a "+2 energy shield gain on hit" jewel if you are using Eldritch Battery. But EB is currently not recommended since mana leech mobs will stop your energy shield recharge. - This gives +2 level to Herald of Agony, allowing its attack speed per Virulence stacks to reach 4% from 3%. - It also caps the herald skill at 45% mana reservation so we can user Hatred to further increase our damage. - If you can't get yourself a 5L, Tabula Rasa will be a better choice. - This is one simple choice of defensive flasks. Despite of Acrobatics, the block it gives still help a bit. - Just keep drinking it all the time. You are a pathfinder so you can do this. - Using with a Basalt flask (with x% increased armour) works even better. - We only use the defensive part of this flask. - To achieve this, your uncapped elemental resistances must be the same. Do not use this if you can't. - With flexible and cheap crafting mods, you can adjust minor resist differences by rerolling them. - Using a blessed orb on your resist ring can also be useful. - This glove is a budget version of the curse ring. - You shall use this when you cannot afford both the curse ring and the minion gloves. - 20% more cold damage added to attacks. - 1000 Accuracy would make your minions more reliable to use. - High elemental resistance plus life gain on hit. - This basically means no more mana issues. - Downside is a 600-700 loss in total life, and it is hard to obtain our desirable helmet enchantment. - New Quiver introduced in 3.6 with 3 sockets. - When you attack with bow the quiver will also attack with socketed bow skills. This means you can have a seperate Curse on Hit setup apart from your main hand 6L. - My suggestion is Toxic Rain - Curse on Hit - Projectile Weakness (or Poacher's Mark). - Our build has a very low amount of increased damage mods. - The first 100% increased is the same as an 100% more. - The second 100% increased is similar to a 50% more, which is still decent. - Third 100% increased would be a 30% more. You get the idea. - This ring is equivalent to a 50% more in our build. - You can craft yourself a rare bow with 100% increased minion damage mod. But you will also gain 100% increased attack time, which means a great drop in mobility. I wasted my first day levelling a Winter Orb build. That damage was so horrible that it is worse than a 2L HoAg. So I go ahead and use the stuffs I farmed and started levelling this build. 5 hours later I finished Act 10. I am addicted to this build I guess. Despite being poor and not having time to play, I still managed to kill T16 Chimera without deaths on this 5 Link setup. 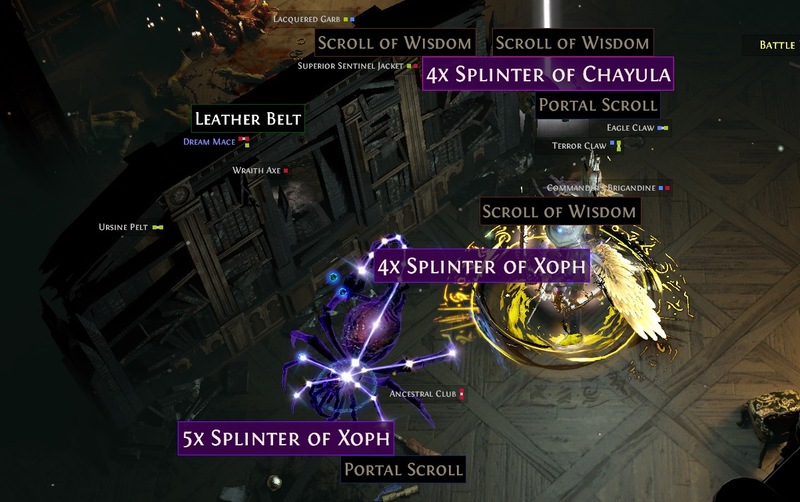 Next step for me would be finding the remaining memory fragments and try shaper/uber elder. Probably still on a 5L because this game won't drop anything worthy. - Rather than buying a 6L with 6ex, it is actually cheaper to link it yourself. - Currently at around 6k life. 1k less than last league thanks to the new helmet. My final expected life on this build would be around 6.5k this league. - Without blood magic gem, this 5L Quill Rain setup is actually equivalent to my 6L setup last league. - I managed to keep all three resists to have the same uncapped values. I was hoping the Wise Oak and Arctic Armour can do some good damage reductions to T15 fortification shits but I still get one-shot to death from time to time. - All these one-shot kills from syndicate members actually have a long delay after they start casting, but in fortification you just can't see anything. This seems to be a global issue so we have to hope GGG re-balance the damage in the near future. Most items are not fine tuned. After 2 leagues of HoAg, I knew that some items are much cheaper on day 1, e.g. Might of the Meek. So instead of rushing a 5-link I rushed the jewels first. 20c each. I got 2. Mapping is fine even with a 4L. T10 maps atm. The quiver grants blind chance and a second curse so I used Projectile Weakness. This dropped the pierce support from my 4L HoAg and grants some chance to knockback. So I linked my RoA with Miam now. New quiver was 12c. Was hoping to use Toxic Rain in quiver but I realized that Toxic Rain has only 5 projectiles. So I am using Rain of Arrows instead. I had MTX on one of the two RoAs so I can see if the curse are applied correctly. They do. Oskarm is used on glove slot. Curse rings, Grip of the Council and Pit of Command is scarce on league start, so I never rush these items. Oskarm becomes the BIS instead. Hyrri's Truth grants Accuracy and Crit chance to your minions. The downside is you deal cold damage so your minion should not. Not worth dropping off Hatred for this. Circle of Nostalgia is good but consumes a ring slot. If the ring is going expensive I am not buying it. There are more investments worthier than this. Accidentally 6-linked the chest piece when trying to 5-link it. So I guess I should buy some other gears with the currencies I saved. Helmet was 1ex, ring 40c. Next upgrade should be a 5-link Quill Rain and a poacher's mark ring. Poacher's mark will give an extra 300k dps. This build is having 1M dps already at this point. Around 2ex worth of currencies are used. Delve is still the best place for farming currencies and chaos recipe. And I got my 25 memory chain amplified with "1% chance to drop breach splinters" mod. And they drop 3-5 splinters each time when they do. Apart from flasks, these items are almost locked in place now. I am still finding another way to tri-curse without using Oskarm. Maybe just CoH setup on a 6L Quill Rain? Or maybe I just dual curse and forget about it. 3. A Tri-curse setup is better than a dual curse + grip of council. 4. Tri-curse is useless on Hexproof maps. It is also useless on totems, making some delve areas a bit harder. As a result, I now have Windshriek on boots to save 4 skill points from tree. I am also using elemental damage with attacks instead of vicious projectiles (it shows higher dps on PoB). I am keeping pierce in inventory for a gem swap with ele damage in case of Hexproof maps. This swap is only possible when you have white sockets on your gear so it could be annoying to some people. If you cannot manage to do that just use Vicious Projectiles-Pierce swap instead. Next step would be looking for a 6L Quill Rain, and an ele weakness curse glove to swap with Oskarm on boss encounters. No big changes since March 17. Killed Uber Elder with no jewel drop. Decided to respec my character again (yes I did that last league as well) and fully invest on movement speed. Farmed Foothills for 2 days for syndicate intelligence. - Lots of veiled items for crafting recipe e.g. - And a Syndicate Mastermind kill for both challenges. With my SSD, the loading time into an instance is 1 second longer when there's syndicate content, and the ambient background sound would be cut off (due to stuttering I guess? ), so it is quite obvious to tell when there's one. I am also forcing my guild members to share their Bestiary dailies. That's because when you have a juicy beast (like the 3ex one), all members in the map will get shareed with one. So it is either earn 3ex alone by yourself, or earn a total of 18ex together. Just remember, you need to do a T13+ map each time before you sleep so the dailies will spawn in the same high tier locations. T8-10 also works as you can buy a shaped version of them. - 2 perfect fossils to get 29%. - 1 Dense Fossil, Corroded Fossil and Metallic Fossil because I am out of Prismatic, and it hits the jackpot. I will also start doing Boss killing services (probably with a low price). The purpose is not to earn money, but to farm myself a Celestial hideout. - You will sacrifice a support gem slot in rain of arrows. - You will need to invest a bit on mana and mana reservation. - Maps without mana regen is painful in boss fights. - If you do not have a Devouring Diadem, that's 5 skill points to EB. You may fetch my current build status on POB using the provided IGNs. hows the build at keeping stacks against bosses? is gmp CA enough for keeping stacks at a reasonable level? Yes. GMP CA would shotgun a mob with 5 projectile hits on your cursor location. In addition to the proc from pierce, you can get 6 poison stacks by hitting the boss once. So after 7 hits you will be able to maintain your stacks at 30-40, depending on whether you are moving or not. interesting, have you tried lioneye's to any extent? or are you fully commited to the homie? Don't think this is going to be terribly efficient just yet. Crawler has terrible AI. Often attacks dead bodies. I just been using it to spread decay since you'll be damned by the time it actually attacks something alive. The AI is only terrible when you are around doors and narrow bottlenecks. Using convocation would help a lot and I don't feel too bad about it. I am expecting to get to Shaper on or before Friday. I will probably do it with a 5L since I can't 6L my armour. A video will be recorded when I do this. I am awaiting your video uploaded. lol! Hope you finish the endgame bosses soon.